Foundation board chairman Alan Schmitt and board member Anna Fierling listen to a report from newly-appointed executive director Allen Schellenberg. 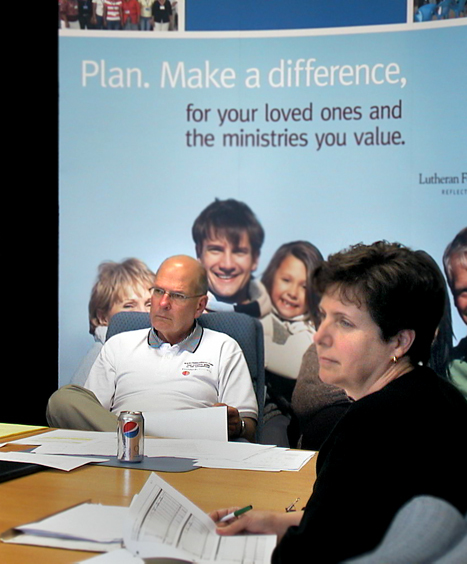 WINNIPEG – Meeting May 28-29, the Board of Directors of Lutheran Foundation Canada (LFC) learned that in the first four months of 2010, the foundation established 13 deferred gifts totalling $2,912,935—a figure well beyond 2009’s annual total of $2,302,245. Congregations form the largest recipient category, with $1,004,360 designated for them in 2010, as opposed to $635,645 in 2009. In addition, the foundation paid beneficiaries almost $85,000 from endowment earnings in 2009. LFC works with Lutheran Church–Canada’s congregations, districts, auxiliary organizations and some institutions to facilitate planned gifts. Speaking to LFC supporting organizations Mr. Cleave noted that “in the near future a larger and growing percentage of all budgets (LCC, districts, congregational) will be dependent on estate and asset gifts.” He stressed the importance of members remaining financially committed to supporting the work of LFC. In 2009, LFC representatives conducted 24 congregational seminars on Christian estate and will planning, with 13 held so far in 2010. Three vacant positions now exist on the LFC board, with Glenn Stresman (East), Anna Fierling (LCC) and Cameron Nicholson (Central) finishing their terms. With the assistance of LFC staff, members will begin the process of nominating replacements.